Knit rows 1 - 4 until hat measures roughly 5.5" (6"; 6.5"; 7"; 7.5") and you've just finished row 2 or 4 of the pattern. Now it's time to move on to our deceases, which will be the same for each hat until you reach row 5. Also, you'll want to switch to your dpns the row before you reach 48 stitches. Clip tail, thread through final stitches, and pull tight. Thread to inside of hat and knot. Tuck in ends. If desired, make pompom and attach to top of hat. What a cute hat! And an even cuter model!! Going to be a grandmom soon. 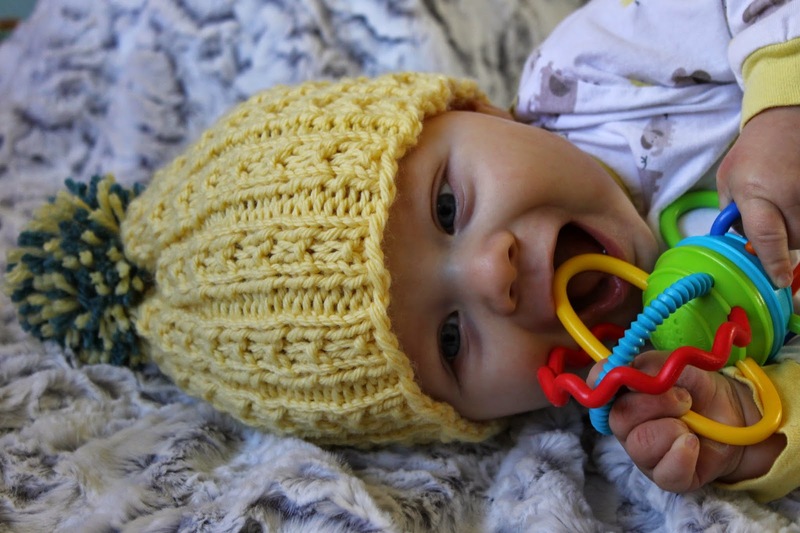 Shall definitely knit this super cool beanie for my grand child. In one of your replies I read that this pattern can be knit ...back n forth n seamed together...it would be very helpful if you could share the pattern details. Hi! Just look below - the whole thing is written out :) And please let me know if you have any other questions. by that cute little munchkin!! Anita - I could try to deny it, but of course I'd be wrong :) The baby is definitely a cutie! 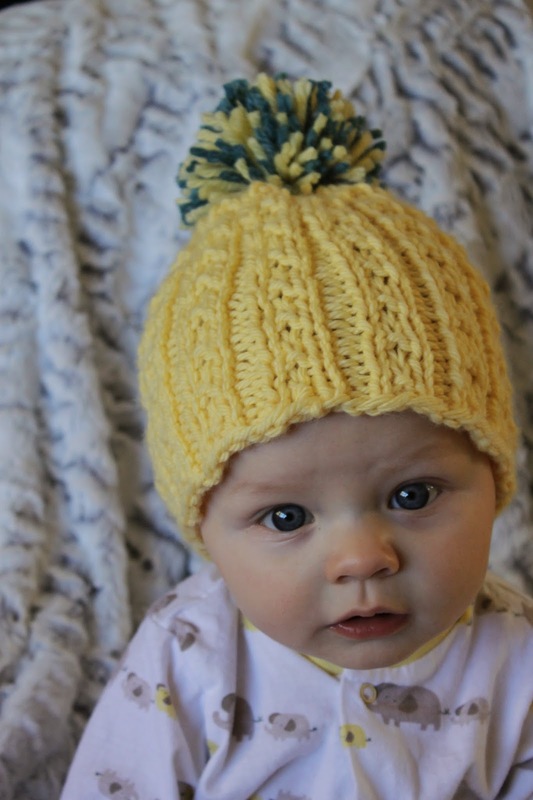 What a cute pattern -- I made a little roll-brim hat for my great niece when she was born; and upon meeting her for the first time at Thanksgiving, her parents told me it is the only hat that really fits her and stays on. They use it all the time. So, of course, I'm thinking of giving her another one (your pattern in their college colors) for Christmas. Thanks so much for sharing it, and I love the name of your site as I'm always in the same situation! I can only hope that this hat is as successful :) And yes, I am the queen of the one-skein bargain bin at my local yarn store. Such good deals!!!! I'm thinking of making this in different sizes for my grandnephews. Is it possible to make this just using circular needles; that is, not switching to DPNs? Thanks for the pattern! See below :) I think everything is in order but if ribs don't line up or anything just let me know! Knit rows 1 - 4 until hat measures roughly 5.5" (6"; 6.5"; 7"; 7.5") and you've just finished row 2 or 4 of the pattern. Now it's time to move on to our deceases, which will be the same for each hat until you reach row 5. Transfer final stitches to scrap of yarn to hold; seam from bottom of hat, threading seaming thread through final stitches when you reach them. Pull tight, thread to inside of hat and knot. Tuck in ends. If desired, make pompom and attach to top of hat. Thank you! :) And, like I said, I think everything is in order with the back-and-forth pattern, but of course I didn't knit it that way so I may have missed something. Let me know if you have any issues! Forget the pattern.....I would rather admire that adorable lil one!!! he is so cute, and of course he's what makes the hat!!! I would like to thank his mommy for sharing so many of her patterns with all of us.....they are great. Wishing you and yours a very Merry Christmas! Thank you! I must admit, I'm very partial to the little guy :) And Merry Christmas to you as well! Love your pattern. I have 1 question, do you actually decrease any stitches in the 1st decrease row? Love this pattern and want to make for my 20 month old granddaughter. Instead of a bulky yarn, would like to use a soft worsted weight yarn using straight needles. Can you tell me what size needles to use. Many Thanks. I am using Plymouth Encore Yarn. Gauge on yarn is US 8 needles - 5 sts.=1 " and 20 sts. = 4". Is that the info you are asking - sorry I am a novice. Gretchen - wow! I appreciate your help! Thank you so much! Hello again! So, standard disclaimers apply: I haven't knit this decrease, and it can be difficult to picture when you're not actually doing it. Nevertheless, I think it's correct. Let me know if anything seems wonky. 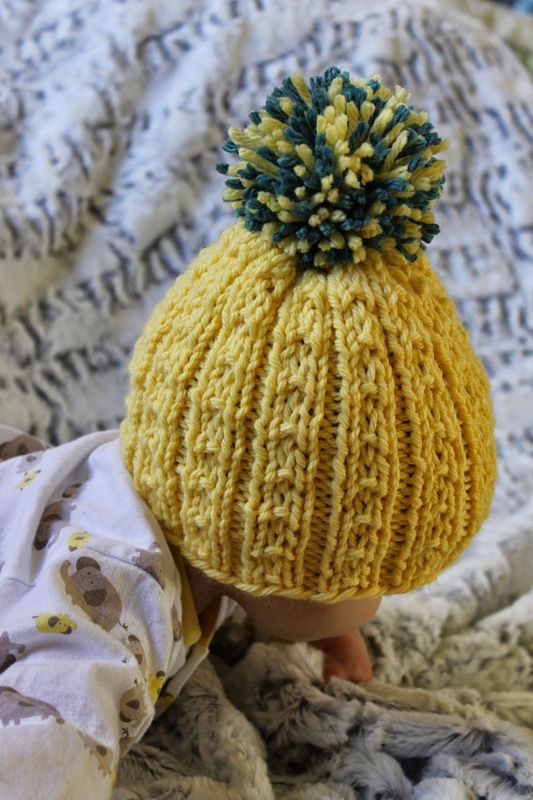 Also, the sizes are a bit different with the worsted weight yarn - the three year hat might turn out a bit big for your granddaughter - you may simply want to knit the 3 year size on size 7 needles instead of 8. Hope it turns out well, and please let me know if you have any issues! Gretchen - I am overwhelmed by your kindness. Thank you so much for working this pattern out for me! I will let you know how it goes! And instead of being known as anonymous - I am Judi from Massachusetts! I'm happy to hear it. :) What a great cause! I have a unlimited supply of yarn :-) the lady I get the yarn from takes hats she and her friends make to a knitting conference every February and then gets more from there and then drops them off at a few different hospital for kids and babies. Next year I'm planning on sending 100 hats I've made with her. 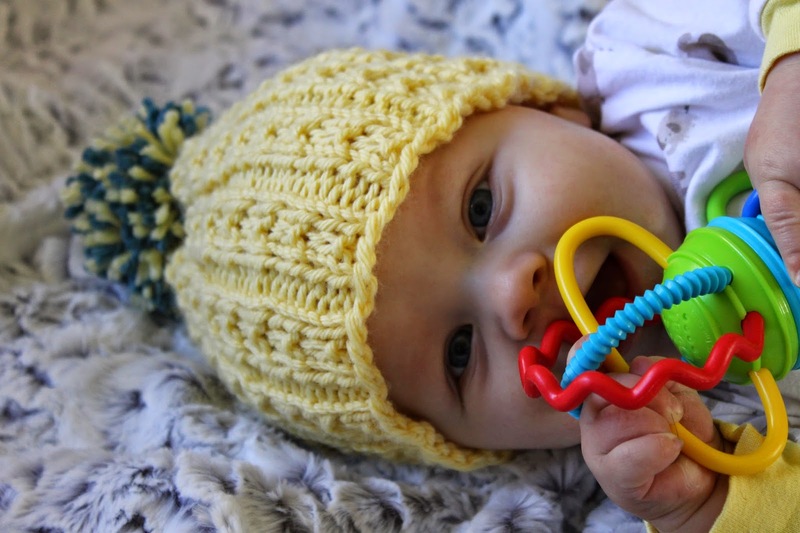 So here is my question, some of the hats are for preemie babies that need to be kept warm, what would be the best way for me to make some of your hat patterns in a smaller size for the preemies? Ok thank you. I don't know which ones I want to do just yet (got a few other projects to finish first) as soon as I know which ones I'll ask about making them in a smaller size. This has to be one of the cutest kids out there. 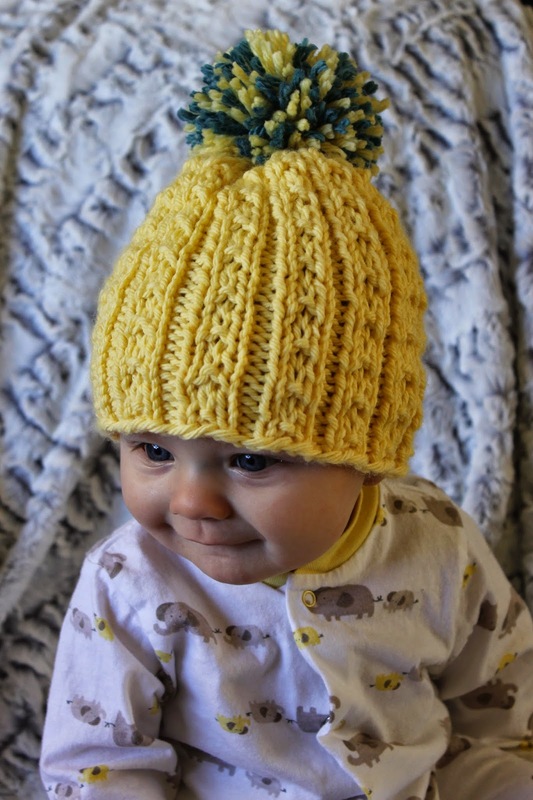 I want to knit this for an adult. If I'm reading correctly, the pattern is worked over 4 stitches correct? I'll be using smaller yarn and needles. Your help is always appreciated. Okay, this should do it for you! Please let me know if you have any questions. Knit rows 1 - 4 until hat measures roughly 5.5" (6"; 6.5"; 7"; 7.5") (<<<--- NOTE: these are the original lengths. I’ve left all of them since I don’t know what size you’re making, but you should reduce whichever one you need by a scant 1”, since the new decrease will be longer) and you've just finished row 1 of the pattern. Now it's time to move on to our decreases. Again, since I’m not sure of your gauge, just remember to switch to your dpns when you need them! I'm so sorry! I hit the wrong button and accidentally deleted your comment. However, I still have the text here: "Hi i am following your instructions. Please how to i close it after decrease row 5. The gap is wide. I forgot to say i am using circular needles." Me too! :) And if you stick with the chunky weight of the original pattern (rather than one of the modified patterns in the comments) it's a super quick knit! You'll be able to make it for everyone you know in no time!!! 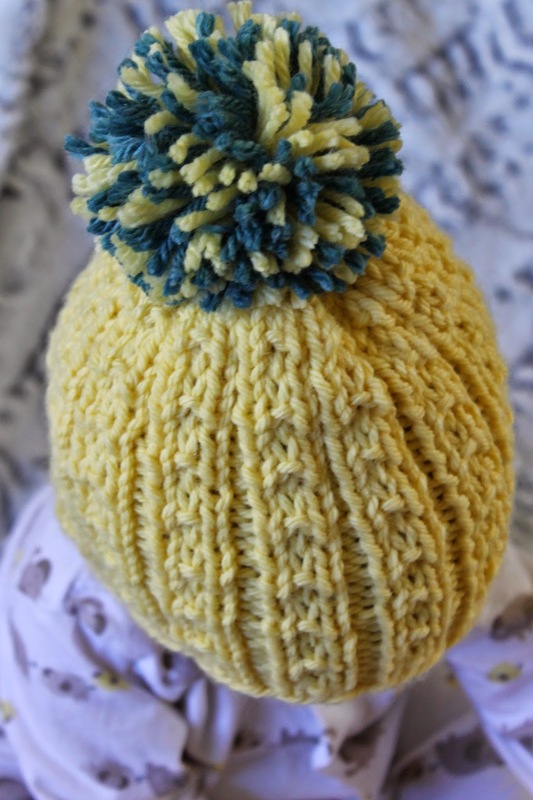 I'm thinking of knitting your pattern in orange and making a pompon using green and brown for the stem. Then knitting some caps in red with a white pompon for Christmas. wow, I wish all designers were so generous! Thanks for this cute pattern, am so casting this on! BUT, I need a little clarification, if that's okay? the first in the comments is knit flat in worsted;correct? The second in the comments is...? I'm not sure its distinction. And, the third is in the round -- is that correct? Yes, the original is chunky in the round, the first in comments in knit flat in chunky, the second in the comments is knit flat in worsted, and the third in the comments is knit with 84 stitches in the round - I'm not exactly sure what gauge or size that one is supposed to be, I just had the cast on number! :) Let me know if you have any other questions. Got it. Thank you, Gretchen! Hi. Love this hat. Can this be knit for an adult? Also, what's a set-up row? Thanks. Hi! this pattern looks awesome, and im trying to make it as a gift, but i only need the hat to be 14 inches. is there a way to make this pattern so that it would fit that? Thank you so much! oh, im also using size 8 double pointed needles and the yarn that goes with that. Thanks! Yes, I can definitely help you modify this pattern. 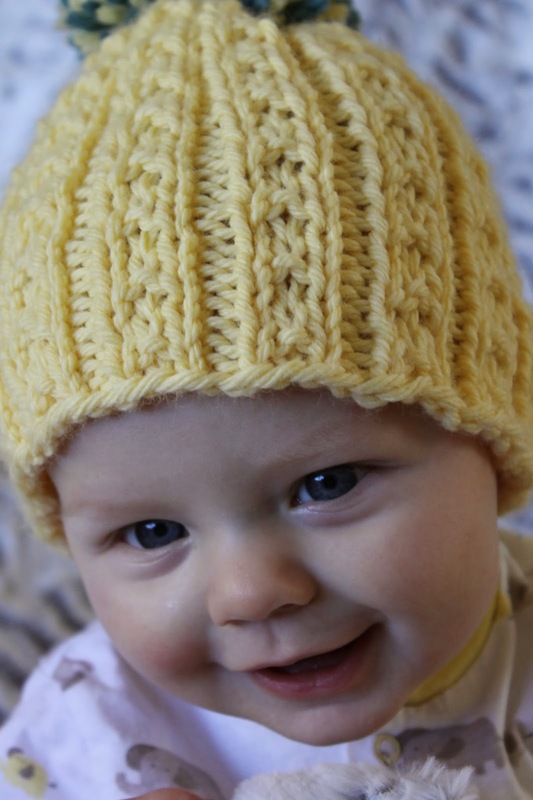 Two questions: One, how long do you want the finished hat? Two, are you knitting it on circulars or straights? Wonderful! Everyone has to start somewhere. :) Let me know if you have any other questions, and have a happy new year as well!!! I really liked the pattern and planning to make it for my 2.5 year old daughter,but with circular needle size 6 or 4.25 mm,hence was wondering about how many stitches should I cast on?